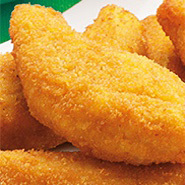 At Eurofrits we have the widest range of frozen products of the variety 'Typical Tapas'. Cooked and marinated spiced chicken wings. Marinated chicken sirloins, breaded and pre-fried.